What a disgrace that the ‘New Zealand Initiative’ would associate itself with a man who is so actively opposed to democracy and the wishes - expressed in poll after poll - of 80% of New Zealanders. 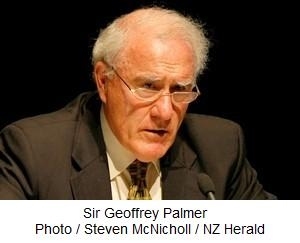 Geoffrey Palmer is a treatyist, pure and simple. It is a dead certainty from his previous pronouncements on the subject that Palmer's proposed constitution for the fictional nation of Aotearoa New Zealand places the Treaty of Waitangi front and centre (or rather his 1989 perversion of it). p.451 (on a Commonwealth Law Ministers Conference on apartheid in Zimbabwe in 1986): "...we went for a strong communique condemning apartheid. It seemed obvious to me that equality under the law was an essential ingredient of the rule of law. ... I met Robert Mugabe and he was grateful for the New Zealand stand against apartheid. I had lunch with the Chief Justice of Zimbabwe, who was black and a firm believer in the rule of law without fear or favour." So Palmer and Mugabe see "equality under the law" as "an essential ingredient of the rule of law" in South Africa. And yet both have total contempt for the same ingredient in their own countries. In both New Zealand and Zimbabwe, to different degrees, those without the required droplet of so-called indigenous blood are now second-class citizens. p.398 (on his 1984 decision to extend the powers of the Waitangi Tribunal to hear grievances back to 1840): "If the remedying of injustice under the Treaty could only be done by Parliament under our existing constitutional structure, then the big obstacle was what John Stuart Mill called majority tyranny. If the legislation addressed the grievances, then majority tyranny would kick in and the likelihood of the issues being addressed in a principled fashion would be reduced. Elected politicians should not be involved in the investigation and formulation of the appropriate remedy." p.399: "I was particularly impressed with the Motunui report. As (Waitangi Tribunal head Judge E T) Durie said, the Treaty was an exchange of gifts: 'The gift of the right to make laws, and the promise to do so as to accord the Maori interest an appropriate priority.'" p.407: "Textual differences between the Maori and English versions of the Treaty should not matter much because what did matter was the spirit of the Treaty. It was a partnership between Maori and the Crown." As any law student knows - let alone a former Attorney-General, Minister of Justice and Prime Minister - treaties do not have partners. They have parties. Palmer's "partnership" was a work of non-legal fiction, along with the so-called "Principles of the Treaty", which he conjured up out of thin air because the real Treaty didn't say what he and his tribal separatist clients wanted it to say. Be very clear: the Treaty that bedevils every aspect of our national life today is not the Treaty of Waitangi 1840. It's the "Treaty of Wellington 1989", as concocted by Geoffrey Palmer. The key principle in the Treaty of Waitangi was equal citizenship. p.407 (on some ministers wanting to send the Court of Appeal's judgment on the Treaty clause in the State-Owned Enterprises Act 1986 (safeguarding lands and waters) to the Privy Council): "Going to London would simply delay the Act and I did not want London meddling in this unique New Zealand invention." No, Sir Geoffrey, heaven forbid that the matter should be heard by the best legal minds of a law-steeped, ancient nation of 60 million, who unlike your mates could be expected to be free of Treatifarian brainwashing and bias. p.409: "...we have come a long way in a short time. That has caused anxiety to many New Zealanders who have found much of the process bewildering and disturbing. This was not a surprising position for a government in a system with parliamentary supremacy to take. The trouble was, I was no believer in parliamentary supremacy. My mail about the Treaty was always adverse and voluminous, but I was not deterred by it. Many of my colleagues were. The purpose of the whole Treaty enterprise was to produce some restoration and some healing. Justice is like that." And there you have it, in stunningly revealing black and white: to Sir Geoffrey Palmer, the will of the people can be safely ignored. p.412: "Palmer's adviser on Maori issues in the Dept of PM and Cabinet was Hekia Parata." Yes, the same Ms Parata who is now supervising the reeducation of New Zealand children, and whose husband, Sir Wira Gardiner, is leading the Local Government Commission's never-ending campaign to inflict racist wards and boards, against the wishes of 80% of voters. p.414: "Insulation from the ravages of extreme opinion has been achieved. The settlements have become mainstream." I suspect Palmer is about to learn that the "extreme opinion" is his own - supported by only 20% of New Zealanders, being the political, academic and media classes, tribal separatists and West-hating socialists. The other 80% of his countrymen stand on the side of democracy. I suspect I speak for the 80% when I say we resent the relentless, presumptuous renaming of our country as "Aotearoa New Zealand". There is no such place. Our nation, until we, the people vote otherwise, is what it has been for the last 474 years: New Zealand. We further resent the attempts by traitors like Palmer and Key to so appease the tribal separatists that we are likely to become Aotearoa New Zimbabwe within a generation at the present rate of surrender. Next year, the National Party and its craven, self-centred leader are likely to surrender control of our drinking water to the tribes via the regional councils. Any why this unprecedented treachery? Simply to pander to the Maori Party and keep Labour out of office. Only a resounding rejection of racist local body election candidates can now stop this. What kind of a country surrenders its sovereignty - from a position of strength - to part-descendants of rebels who failed to steal it by force in the 1860s? What kind of an organisation endorses such treachery by promoting a constitution that entrenches a manifesto for such surrender? Expect a hostile reaction to this "initiative" at your meeting from people who regard Palmer as one of New Zealand's greatest traitors.